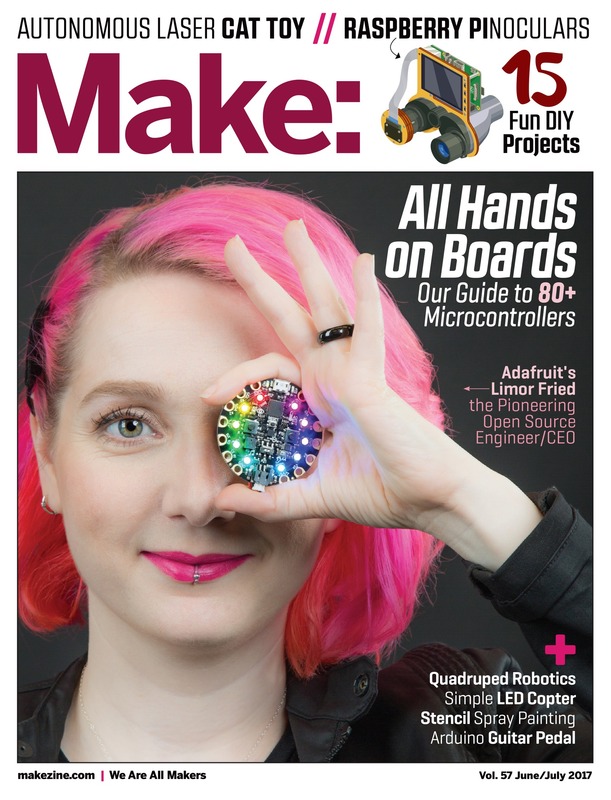 Limor “ladyada” Fried on the cover of @MAKE magazine #MakeV57 « Adafruit Industries – Makers, hackers, artists, designers and engineers! Thank you to the team at Make: Juliann Brown, Hep Svadja, Gareth Branwyn and everyone else who worked on this volume of Make: 57 and thank you to the Adafruit team that set up, helped and was part of the article and photoshoot and the entire team for making Adafruit, Adafruit. Most of all, thank you to the community of makers out there who have supported Adafruit over the last 10 years. Make: 57 is available for subscribers this week or so, on stands and more. Subscribe to Make: here. We’ll try to stock it in the Adafruit store if that’s possible too! Make: Volume 57 is our annual boards blowout, an examination of the latest from the world of microcontrollers and single-board computers. These prototyping devices are more powerful than ever, with the latest crop now capable of machine-learning tasks such as instantly identifying objects and driving autonomous vehicles. Meanwhile, new board ecosystems have started popping up, giving makers some great alternatives to the venerable classics. Our boards guide insert will help readers figure out what is right for their project. The issue also includes profiles of notable people and companies in this space, with a large feature on Limor Fried, Adafruit’s pioneering open-source engineer/CEO. And, as always, a range of projects to keep you busy in your workshops and makerspaces. This past Thursday, we here at Make: Facebook livestreamed an unboxing video of advance copies of the newest volume of our magazine. The stream featured Executive Editor Mike Senese (@msenese), Senior Editor Caleb Kraft (@calebkraft), Art Director Juliann Brown (@Jbear), and Digital Fabrication Editor Matt Stultz (@MatStultz). The four shared stories about how the magazine’s universally loved cover came to be, and discussed the process of formatting and constructing Volume 57’s layout. You can watch the full livestream below (skip ahead to 9 minutes). Make: – Volume 57 is our annual boards blowout. This year, the magazine includes a guide of over 80 different microcontrollers. Make: Facebook – Make: volume 57. And a special request, if you like to see engineers like ladyada featured in Make: (and more) tweet/tag #MakeV57 on social media to let Make: know!